Lewis Hamilton (1st, 1:16.173): "The team has been working so hard in the last weeks to improve our performance so I must say a big thank you to everybody here and back at the factory. They have kept their heads down and been really open-minded to find new ways to try and improve; it's been great to be part of and that's what it takes to be a winning team. It was a very close qualifying session today and it took everything we've got to take pole. Ferrari were sandbagging until this afternoon and Valtteri has been driving exceptionally well; it's fantastic for the team to get the front row and I know everyone will be very happy. Qualifying has always been a strength for me but I've had some tricky sessions since Melbourne, so I'm pleased to be back in a good position with it. It has been a constant learning process with the tyres, getting them working in a very narrow window, but today we had them working. There is still lots of work to do tomorrow but this is a good way to start the weekend." Valtteri Bottas (2nd, 1:16.213): "Qualifying was good for me but not quite perfect - and it ended up very close on the final times. But for us as a team this is a perfect result with two cars on the front row. I had a mistake on the first run in Q3, which meant I only had one proper shot at it - that was a good run and, of course, if you do the laps again then you can always find something more. It was good to work the SuperSoft tyre a bit better today, it felt like a better tyre for us so we have made some good progress in that area. I am feeling really good in the car at the moment and, looking to tomorrow, I think we will be strong on race pace. I have some catching up to do overall in terms of the points, so I will be aiming to do as well as I can." Andrew Shovlin: "We saw great laps from both of our drivers today and it's very satisfying for the whole team to secure our first front row of the year. We had expected conditions to cool today but hadn't expected the track to get quite as cold as it did. The car was working nicely during the final practice session and the drivers were able to evaluate the overnight changes and get a feel for the car on low fuel. By qualifying, the temperatures were not dissimilar to those from the final winter test and getting the most out of the rubber was not easy. We'd planned to try and get through Q2 on the soft tyre but it seemed like the entire top ten had the same idea. In these conditions, it was really hard to work out which was the faster tyre. We had the option of going on SuperSoft or Soft tyres for the final run but decided to stick with the Super as we had a good balance in the first session and it seemed a little easier to extract the grip on that compound. The final moments of qualifying were fairly intense as we waited to see whether Riccardo or the pair of Ferraris could improve on their time. It's useful to start this race with both cars on the front row as it's a very long run down to Turn One. We're expecting some overnight rain, which will cause the track to reset, together with cooler conditions than those we experienced on Friday. It's going to be a very difficult race to win tomorrow, given the range of strategies that could come into play, but we have had a good car in all the races this year and will be doing everything we can to turn the front row into a double podium." Toto Wolff: "That was a fantastic qualifying session from both drivers and from the team as a whole - and a well-deserved front row. The aerodynamic upgrades we brought to this race are working well and the competition between Lewis and Valtteri is incredibly close - and we can feel that driving us forward at each race weekend. Although the gaps in practice looked to be in our favour, we knew that things would close up in qualifying and that proved to be the case. But the guys stayed calm, made the right calls and delivered when it mattered. Now, we need to turn our attention to the race and the challenges it brings; on the long runs yesterday, Ferrari were very competitive and Red Bull particularly strong, so we know it will be a hard-fought Grand Prix. First, we need to win the start and maintain our positions - and then maximize our opportunities tomorrow as they come." Max Verstappen (5th, 1:16.816): "We all know in Qualifying the others turn up their engines so we just have to try and keep as close as we can. You have to consider that from turn one to turn four is flat out now, also turn seven to turn ten. It is like having two more straights out there so relies even more on the engine power. We still have a good chance in the race as long runs look good, it is just a shame to be this far off on Saturdays. The updates have made a difference which is a positive and shows we are heading in the right direction. I had a moment in turn one on my last run which meant I couldn't finish it, I lost the rear and therefore ruined the lap. I think that lap could have been our best time but we still wouldn't have made the top three, perhaps fourth was achievable but fifth is not too bad. The conditions were very tricky out there, the track was unpredictable and it was unclear which tyre to go with. The supersoft and the soft are really close to each other in terms of performance so it's hard to choose a direction in Qualifying. Soft looks like the quicker tyre ahead of tomorrow over distance. This isn't usually a strong track for overtaking so maybe it will come down to the pit stops, or a bit of rain could mix it up. We will try our best." Daniel Ricciardo (6th, 1:16.818): "I really think we got the most out of the car this afternoon. I tried both the soft and supersoft tyre in Q3 but we have been more comfortable on the soft all weekend. At the start of Q3 I did a pretty good time on the supersoft, but for me I didn't think we could go quicker on that tyre, so I wanted to try the soft again. I went a bit quicker on the soft but not enough to make up any positions. It was strange, I think the colours are different, but the tyres are pretty much the same. I'm glad I tried both compounds, because if I did both runs on the super I probably would have wondered what the soft could have done, so I think we did everything we could. With the laps we put in I thought we would be more like a couple of tenths from pole, not six or seven, as our car didn't feel too bad which is a little frustrating. We are always a bit more comfortable on the long runs, so I would hope that our race pace tomorrow is better and we can challenge the four cars in front." Christian Horner, Sporting Director: "To qualify fifth and sixth for the Spanish Grand Prix is about where we expected to be. We tried a different strategy across the two cars at the end of Q3, but there's just not much between the soft and the supersoft tyre. Max got a little ambitious into turn one on his final lap so never had the opportunity to improve, it is possible he could have got Kimi, but that would have been the maximum today. However with the indications from our long runs on Friday we are hopeful we can play a part in challenging Ferrari and Mercedes and it could be an interesting race." Esteban Ocon (13th, 1:18.696): "I am a bit disappointed about our end result because we didn't really have the pace we expected. I was happy with how the car was set up and we can see the updates we brought here are working, but we need a little bit more to close the gap with the front of the pack. I am still feeling positive for tomorrow. We are not too far away from the top ten and our race pace is not bad. We need a good start and then we'll see what we can do. Last year I gained five places from start to finish and I'd be happy to do the same this year." Sergio Perez (15th, 1:19.098): "It was a disappointing qualifying session. Q1 was okay and the car and tyres were working well, but in Q2 we lost so much performance. It's really odd because we used the same strategy as we did in Q1, but the tyres behaved totally differently. We could not switch them on and the car was sliding around, which is why my lap was four tenths slower than Q1. I still hope we can fight back tomorrow and come away with some points." Otmar Szafnauer, Chief Operating Officer: "For various reasons today's qualifying session didn't allow us to deliver the performance we expected. Esteban's session was clean enough, but we were missing a few tenths of performance needed to progress to Q3. Sergio suffered with tyre warm-up issues in Q2 and complained about a lack of grip, which meant he couldn't improve on the time he set in Q1. It's disappointing not to be higher up the grid on this track where grid position is so important, but we will try our best to turn things around in the race. The car looked competitive during the race simulation runs yesterday afternoon so let's see if we can recover some points tomorrow." Sergey Sirotkin (18th, 1:19.695): "It's been a tough weekend. We know it's not the best track for us, and it doesn't hide our weaknesses, but it's definitely more difficult than we expected. Missing FP1 made it more complicated for me and our three-place grid penalty doesn't help, but it won't make a big difference for us. We have been doing quite a good job to recover the situation since Bahrain, and we have made some improvements. Today is not our day, nor is it our weekend, but I don't want to be too negative. I don't want to break the positive trend in the team just because of one weekend. It's tough but what can we do. Believe me, everyone is working and applying the maximum pressure. It is how it is, we are going flat out to improve things." Lance Stroll (19th, 1:20.225): "I was on a much better lap, but I just lost it going for every little bit right at the end. I am not going to beat myself up when I know this is realistically where we are today. I was on an okay lap but nothing to get out of Q1, which was expected all weekend. We saw an improvement in Baku, but this weekend we are right back to where we were. I think it is something we just need to keep chipping away at, so hopefully we will get there sooner rather than later. The circuit here for sure doesn't suit our car." Paddy Lowe, Chief Technical Officer: "We didn't expect to be strong today after our performance yesterday, but we have actually made some progress overnight, even though that doesn't move us up the grid order. Our two drivers did a great job with the material they had to work with today. Unfortunately for Lance, he lost the car and caused some damage which we'll need to fix this evening. We've not done a good enough job and we need to come back in a better position. We're working very hard back at the factory on the problems that we understand, but this is yet to be translated to the track. There's a lot more to come as the upgrades we've brought here were never meant as a solution for our underlying problems." Carlos Sainz (9th, 1:17.790): "It was a good qualifying! We've turned things around well since yesterday and the team has done a great job putting a much better and quicker car together. Yesterday we knew making Q3 was going to be very tough, but we worked hard, made changes and improved a lot. Tomorrow I'm confident we can have a strong race; we're in the top ten and the target is to keep scoring points. We're starting the race on the Soft tyre with an ideal strategy to hand. I'm looking forward to putting up a good show for my home crowd!" Nico Hulkenberg (16th, 1:18.923): "We had some problems with the fuel system causing the pressure to drop which impacted on power delivery. This was very unexpected and we'll be looking into why it's happened. It will make our day tomorrow more difficult as we know overtaking is very tough around here. We'll have to work out a strategy and hopefully come through it. We're still aiming to clinch points. We'll try our best and race hard." Alan Permane, Sporting Director: "Carlos did a fantastic job at his home Grand Prix, especially setting his Q2 time on the Soft tyre, which we felt was very similar, if not a little quicker than the Supersoft. Nico had a fuel system problem and he wasn't able to put a lap together because of the fuel pressure drop outs. That's something we'll address. It was a session where we stayed flexible and reactive with our programme and Carlos stayed open-minded and flexible to do a good job with this. We started the weekend with the car not performing as wanted but improved it every day, so we're hoping for more to come tomorrow. We need to see what we can do for Nico with a free tyre choice and plenty of tyres in hand; it's still possible for a good result for him. Carlos' race is more straightforward, he will start on the Soft tyre and I'd imagine it will be a similar strategy to others around him." Pierre Gasly (12th, 1:18.463): "I'm pretty happy to make it to Q2 and qualify P12. We've got some performance back which was important after the last two weekends in China and Baku, so I think there's positives to take from today. We knew coming here it would be a bit tough because we saw some teams with big updates, but the most important thing for us was to understand our package, and I think we got some good answers. We still need to analyse our performance but overall we're pretty happy. Things have been working better this weekend, we were in the top 10 twice in FP1 and FP3, and in qualifying we weren't so far off the pace, so it's encouraging to see we are coming back into the fight. The race will be long and we know how tyre choice and strategy can make the difference. We will have free choice with the compounds for the start of the race, so I think it's a good position to be in." Brendon Hartley (20th, No Time): "It was quite a big impact! We normally run a bit of kerb on the entry to Turn 9, but I took one or two centimetres too much and I just clipped the dirt area which flipped the car around pretty quick. The car was feeling good this morning, I didn't have a clean run at the end of the session, so the lap time didn't show the true pace we had. I'll try and stay positive. I'll have a good sleep and come back tomorrow fresh, anything is possible. I know the team started from the back of the grid last year and scored points, so that has to be the goal for tomorrow." James Key, Technical Director: "Some mixed fortunes for us today. Unfortunately, Brendon had quite a heavy accident in FP3 which damaged his car quite extensively and didn't leave enough time to prepare it for qualifying. In any case, with a shunt of that magnitude you want to make sure that you take the time to look at everything in fine detail and ensure that all the stressed parts are accounted for. The most important thing is that the driver is OK, and he will be back in fighting form for tomorrow's race. For Pierre, he was building this morning on some new directions we looked at last night to improve the car's balance, we had our ups and downs during Friday running, but generally the car balance was too inconsistent for both drivers. Pierre was happier with his car straight away in FP3 and was able to push with more confidence than yesterday. In qualifying, we could see it was going to be extremely tight with the teams around us. 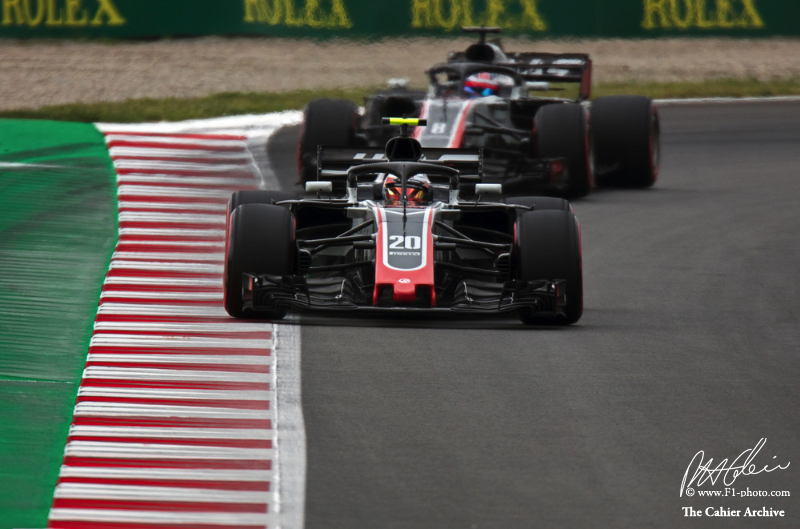 It looked like the Haas had a little bit of an advantage but otherwise it was difficult to predict. I think we came away feeling that we may have missed an opportunity for Q3. It was really close and unfortunately, Pierre had a bit of understeer in the middle of his final lap and lost a few tenths in the second sector, which left us slightly shy of the top 10. Q3 was possible, but we can't complain, we're just behind the top 10 and we can choose our tyres, so we're well placed to fight for points tomorrow." Toyoharu Tanabe, Honda F1 Technical Director: "It's a great shame that Brendon was unable to take part in qualifying after his accident in P3. However, the most important thing is that he is okay and will race tomorrow. There is extensive damage to the PU and so we have replaced it and sent the other one back to Sakura for a full examination. As for Pierre, I felt he drove well in qualifying and we expect him to have a good race from twelfth on the grid." Kevin Magnussen (7th, 1:17.676): "It was a really good qualifying. P7 for us is really pole position – it's the best you can hope for if you're not in a Ferrari, Mercedes or Red Bull. I'm really happy with that. I'm looking forward to tomorrow and, hopefully, we can bring home some good points. It's a good position to start, and again, P7 is probably the best we can hope for if everyone finishes. It's still a very tight battle, but I think our car is strong, and we can be happy with where we are at the moment. We need to keep up the levels, continue to develop, and keep putting stuff on the car." Romain Grosjean (10th, 1:17.835): "Pretty good qualifying for the team – both cars in the top-10. Obviously, Q3 could've been better and I'm not super happy to start P10 but, in general, I think we're in a good position for the race and I'm happy for the team." Guenther Steiner, Team Principal: "A very good day today. Finishing seventh and 10th in qualifying is a very good position for tomorrow. So, we just have to bring it home. That's our aim – get two cars in the top-10." Fernando Alonso (8th, 1:17.721): "Making it into Q3 for the first time this season feels fantastic, and if you combine that with the fact we are at our home grand prix, it's a double benefit. I'm happy – we were P13 in the last few qualifying sessions, so P8 today is definitely a step forward. The top guys are still too high up so we need to close that gap, but I'm pleased that all the updates we brought here seem to be delivering as we expected. We just need new parts as soon as possible and to keep going in this direction. Every Spanish Grand Prix is special, and there are always a lot of emotions when you go out there and feel all the support. The fans are not giving you extra performance because they can't push the car, but they can motivate a little bit more so we seem to always perform a little bit better here. Hopefully tomorrow we'll put on a good show for all the fans. Maybe there'll be some rain around, and that could be very interesting. Over the winter we've learned that a wet track is very slippery here, so we could have a chaotic race and maybe out of any chaos we can benefit." Stoffel Vandoorne (11th, 1:18.323): "We've had the best qualifying session so far this season here, and it was a very close one, again. The tyre selection was not an easy one to decide. The feeling was positive in the car, and we ended up very close to Q3 – Fernando just made it – which shows the parts we've brought here are working well. It's a step in the right direction and we need to keep improving like this in the next races. I think points are possible tomorrow. So far, we've done pretty well on a Sunday, as we have a good understanding of the strategy and how to use the tyres. We've had good race pace and we need to fight to get ourselves in a good position in order to benefit from other people's mistakes. Conditions out there have been tricky all weekend with a lot of cars going off, so tomorrow we need to be sharp. We must make sure we don't make any mistakes, and then I think we can be in a position to benefit and get some points." Eric Boullier, Racing Director: "Today's result is an important validation of the immense amount of hard work that is being put in behind the scenes to move closer to the competition ahead of us. I'd especially like to thank everybody back in Woking for their tremendous team effort in bringing all the new parts we planned to complete our updated package on time. Of course, Saturday doesn't offer any championship points. However, while not yet a cause for celebration, eighth and 11th positions on an aerodynamically-challenging track such as this mark our best qualifying session of the season so far, and is certainly the step forward we were hoping for on track to correlate with the evidence we saw in simulation. We've said many times that we can't expect miracles overnight, and there is a long season ahead of us, but we feel today's result demonstrates the first step for us in the progressive development of the MCL33. Time will tell, and the first real test of our updated package will come in tomorrow's race. The primary objectives are to race cleanly in this tight midfield pack, stay out of trouble and optimise our strategy to ensure we maximise our chance to bring home more points. Let's see what we can do from there." Charles Leclerc (14th, 1:18.910): "It was a positive day for us, having extracted a stronger performance here in Barcelona than we had expected. We made some good steps forward during FP3. I did my best to put everything we have learned this weekend together, and completed a good lap during Q1. It feels amazing to have made it into Q2 for the second time in a row, especially considering that we did not arrive with high expectations on this type of track layout. I am very pleased about the progress we have made. Now we must focus on the race and make the most out of it tomorrow. Hopefully, we will take some positive results home." Marcus Ericsson (17th, 1:19.493): "It was a disappointing qualifying for me. I was struggling with the balance and the car didn't feel so good. It is a shame to finish qualifying in Q1, as we have been quite competitive this weekend. At the same time, that is a positive, and we should be able to recover some positions during tomorrow' race. Let's see what is possible tomorrow."